Youth Development Programme (YDP) is a programme for the educated youths who are vulnerable and belong to economically weak families and underprivileged communities. 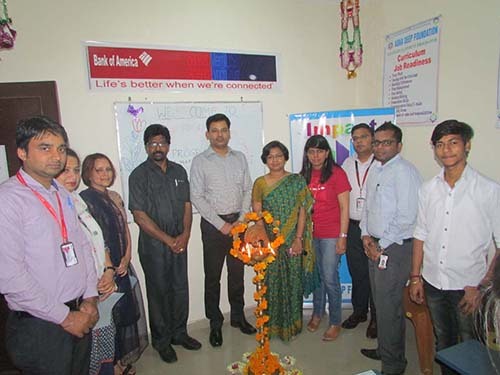 Bank of America supports the programme. YDP was launched in Carterpuri and Sheetla Colony, Gurgaon on 23rd April 2015. It works to reduce poverty and vulnerability by facilitating young adults aged 18-35 years who have completed 12th Std. of schooling and belonging to economically weak and disadvantaged communities. Their employability is increased so as to obtain gainful employment and lead a quality life. The duration of the course is 3 months and after completing the course, students are placed in sectors like Retail and BPO. The main subjects taught in the programme are- IT, Financial Literacy, Work Place Readiness, Work Place English, Customer Care Service, Hospitality and IT Enabled Services. As part of the course, exposure visits are made to various retail sale outlets, food chain outlets, banks, BPOs and corporates. Apart from the main subjects mock interviews are conducted to handle job interviews successfully. Life skills training is also conducted to handle difficult life situations in a positive manner and increase the confidence levels of the trainees. Career guidance is given to all the trainees. Apart from the primary activity of training and placement of youth in jobs the project also works on increasing awareness about the programme in the community, mobilizing youth from the community to be part of the programme, developing infrastructure for the programme and networking. Through this programme many youths will be getting decent jobs and supporting themselves and their families financially. The main aim of this project is to provide economic empowerment opportunities to the underprivileged community youth by improving their employability through specific skills training. To provide training on employability skills based on the need assessment and market trends. To enhance leadership skills through confidence building exercises. To provide them placements according to their interests and skills. Carterpuri is a village in Haryana, India, very close to Delhi and 6 kilometres away the main Gurugram road. This is a Yadav dominated village. The US president Jimmy Carter visited the village in 1978, when it was known as Chuma Kheragaon. Soon after it adopted its current name Carterpuri Village. Sheetla Colony is located opposite to famous Sheetla Mata Mandir in Gurgoan. The colony is adjacent to Palam Vihar and Sec 6 Gurugram. The target areas consist of a population belonging to low income families and categorized as underprivileged communities. There is need for development in terms of education, health, sanitation and basic infrastructure such as water & electricity. The youths are unemployed and needs guidance and options to achieve a higher goal. The Youth Development Programme and its curriculum was launched in Carterpuri, Gurugram on 23rd April 2015. The YDP centre was also inaugurated in Carterpuri and Sheetla Colony on the same day. The much needed programme was finally launched for the youths of the communities. The rising corporates in the vicinity of the target areas has motivated many youths to be part of the society but they were far lacking in skills. The YDP was launched together by Bank of America and Asha Deep Foundation. Heads, senior officials and staff of both the organizations and community youths were present in the event. The invitees addressed the youths and interacted with them regarding the programme. Youths were highly motivated to be part of the programme. Total of 300 underprivileged youths aged 18-35 years will be benefited directly (2 batches of 25 youths per batch in a quarter and 3 such batches in a year per centre) from the YDP Carterpuri and Sheetla Colony Centres. From the activities the youth will benefit in developing their personality, improving their life skills , gaining IT skills, learning to face job interviews, getting jobs, becoming financially independent, managing finances, becoming a productive & useful member of the society, gaining self-confidence , gaining self-esteem and gaining respect from society. The Youth Development Programme (YDP) was initiated in Gurugram in April 2015. After a one and half month long involvement in identification of target areas, field visits, survey, recruitment of instructors, preparation of the centre, community mobilization, identification of trainees, screening and enrolment, the training was started in June 2015. The target number of youths to be enrolled in the 1st batch is 100 underprivileged youths in the target areas. The project has successfully enrolled 133 trainees in Gurugram Centres. Morning and afternoon sessions are being conducted regularly. Challenges such as enrolment of female youths, motivating youths who are already in some economic activities in unorganized sector and making the community realize the importance of the course, were encountered by the project team during the implementation. Youth contributing in the development process of the community.